Categories: Entertainment, For Kids, News Services, International, Paginated Pages, Mini Page, The Mini Page, Mini, Page, Kids, Weekly. Each week, The Mini Page explores a different topic in a feature article that includes photographs and graphics. 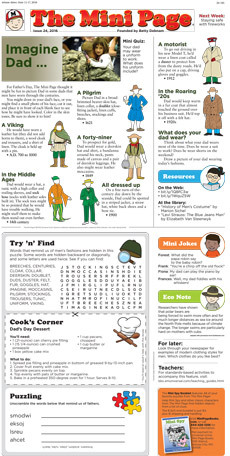 Word puzzles, jokes, recipes and suggestions for further research round out the opportunities for fun and learning. 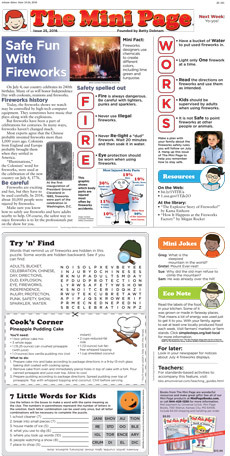 A Standards Spotlight, accessible online at bbs.amuniversal.com/teaching_guides.html provides activities for teachers and parents to use in conjunction with each issue. 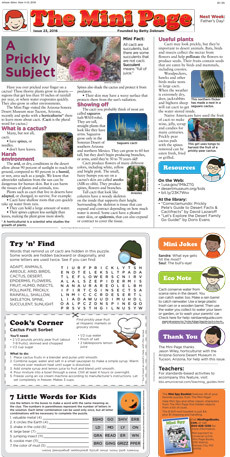 Appearing in hundreds of newspapers in the U.S. and abroad weekly, The Mini Page is loved by children, parents, teachers, English-language learners -- and anyone who wants to discover something new while having a lot of fun. The Mini Page offers a variety of books and other products to enhance learning and provide resource material for elementary school students! Visit MiniPageBooks.com to purchase products from The Mini Page, or call 800-642-6480 to order. A perfect accompaniment to STEM learning for elementary students, The Mini Page® Book of Science combines five recent issues about basic science concepts: matter, energy, gravity, electricity and magnetism. 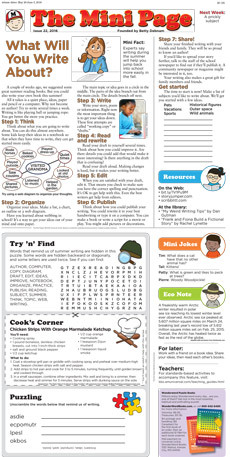 This 24-page softcover book is a wonderful reference for classrooms and for use at home. The Mini Page® Book of Science also includes a Periodic Table of the Elements in Pictures, showing how each element is used. The Mini Page’s popular series of issues about each state is collected here in a 156-page softcover book. Conveniently spiral-bound for ease of use, this invaluable resource contains A-to-Z facts about each state, along with the District of Columbia. Illustrated with colorful photographs and art, and complete with updated information, The Mini Page® Book of States will be a favorite in classrooms and homes for years to come. These Mini Page articles are really "a great fit" for my 3rd graders! We've saved so many articles over the years. Not only do they often hit the mark with curriculum topics throughout the year, they have great appeal for 8- and 9-year-olds. They are usually so appropriate for our kids' reading levels, their interests, and they provide interesting information that our kids are able to understand. It is often difficult to find appropriate informational texts on topics that students want to learn about that are both comprehensible and hold their interest. 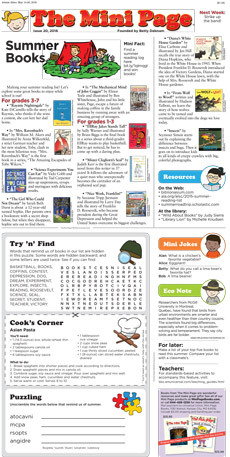 The Mini Page is truly a periodical that kids learn from and enjoy reading - especially 3rd graders. You really know your audience! Most kids have had Betty Debnam as a teacher. As founding editor and editor at large of The Mini Page, Betty has taught the nation’s children and many adults since 1969 through this award-winning newspaper feature. Debnam boasts both a newspaper and educational background. Her grandmother, grandfather and father were newspaper editors. She holds a master’s degree in education from Duke University and taught elementary school for 12 years. Each week since The Mini Page's, inception, it has left its mark on students, educators and parents across the country as a fun and constructive way to learn. The Mini Page's, articles are well-researched and presented so that newspaper readers representing all ages and reading levels can enjoy it. Debnam, a Raleigh, N.C., native, has won numerous distinguished achievement awards, including more than 20 from the Educational Press Association, a Newspaper Association of America Lifetime Achievement Award, membership in the NIE Hall of Fame, and many others. She also is a member of the North Carolina Journalism Hall of Fame. The Mini Page is owned and distributed by Andrews McMeel Syndication®. Welcome to Mini Page! This beloved newspaper feature has been a part of growing up for millions of readers for more than 45 years. 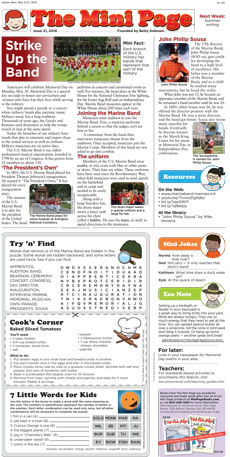 Today, Mini Page covers social studies, science and other topics ranging from the mysterious disappearance of some species of animals to the duties of a U.S. ambassador. Each issue is thoroughly researched using only the best sources, and each includes activities for teachers to implement in conjunction with the materials. The Mini Page's accessible newspaper format gives kids a leg up on becoming newspaper readers as adults. And now, The Mini Page is also available as an interactive online product that can be integrated into a newspaper's Web site or Newspapers in Education site.